I'm just starting out so there's a lot that I want for my collection. Any figures- I do have quite a few figures but there's that many that exist that it's highly unlikely I already own a particular figure. Also any Axew, Dunsparce or Swampert items- same as Jirachi. 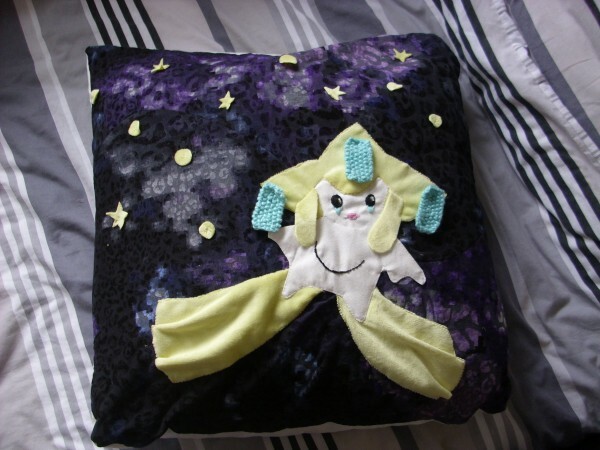 Would love to own this Jirachi bag. Any of those charm type things. I really want to complete my collection of those, they're called Waps- here is the list of all the ones I need. Hello! 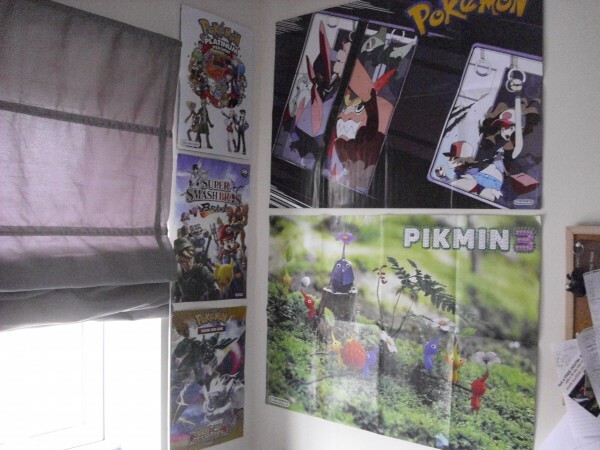 After being inspired by Sunyshore I decided to start seriously collecting Pokemon stuff, and so today I went round my room and found as much Pokemon merch as I could. First off I got my figures out. Apart from my games, this is probably the biggest part of my collection. Pretty sure this first lot are Pokemon Kids. You buy them in sets of 6- I have 2 sets if you count :P I thought I had more than this though, maybe they're hiding somewhere. One set was bought at home while the other was on holiday in Mexico I believe. This lot I think are Tomy Monster Collection. They're VERY old and VERY played with, meaning a couple are broken! 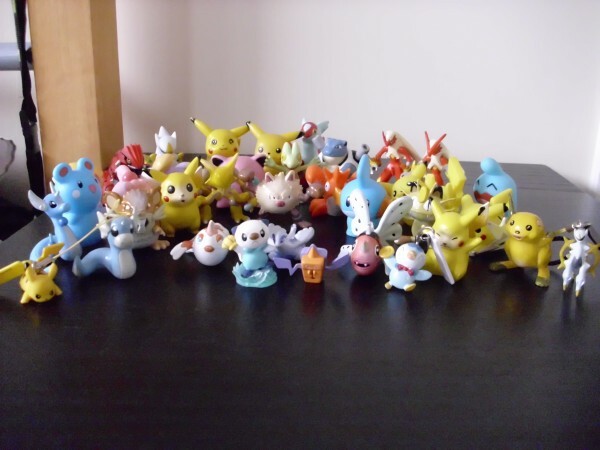 You can see Raichu has an ear missing and Raticate has no tail either! These are the rest of my figure collection. Treecko and the two Blazikens might also be Tomy Monster Collection but I didn't know at the time I took the photos. Treecko has lost its tail! I recall many attempts to stick it back on but all failed eventually and now his tail is lost forever. 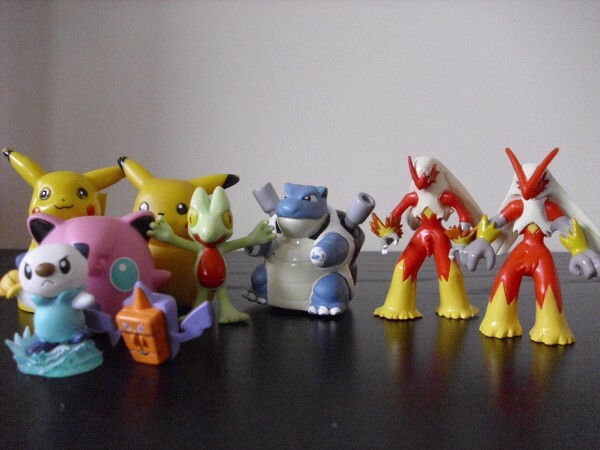 :( The right-hand Pikachu, Blastoise and Jigglypuff are probably some of the first figures I got- they're special in that they have metal balls underneath them so you can slide them around on the floor! They were fun when I was little, I used to invent games with them. 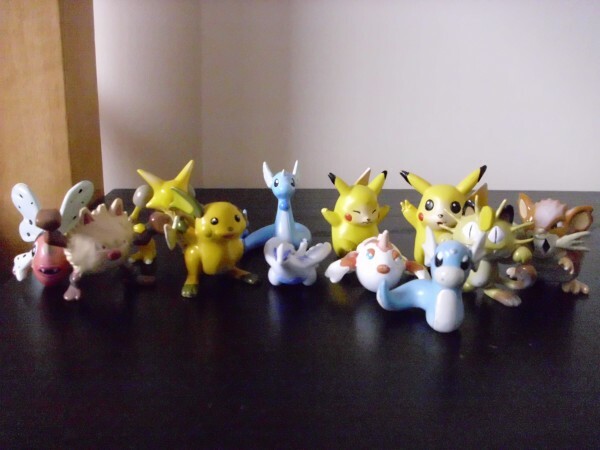 :P The Pikachu on the left has a yellow, circular base on it, I'm not sure where it came from but included it here with the rest of the unusual figures. 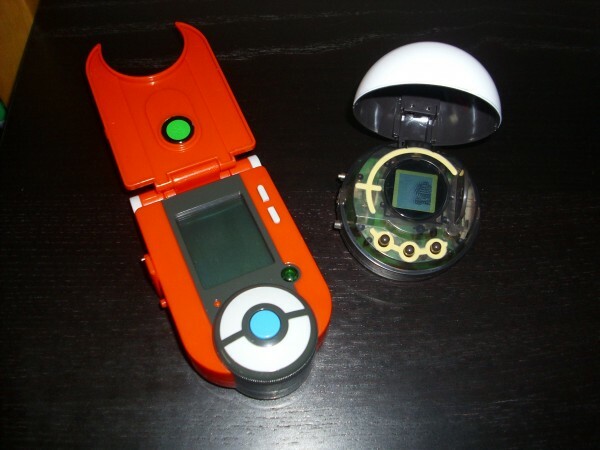 The Rotom I'm pretty sure is a Zukan from what I've heard. Unfortunately I can't find the base it came with, nor the ordinary Rotom that goes with fridge Rotom. 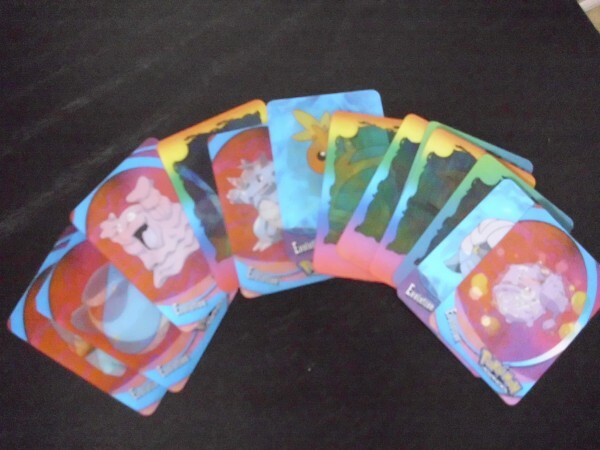 :( Lastly here, the Oshawott was a promo figure in the BW TCG tins- I really love the style, I just wish it was a bit bigger! This is my complete figure collection! Once you put them all together there's more than I thought I had. :P Here's hoping I can expand this collection a lot more! While getting all my figures out I came across these! 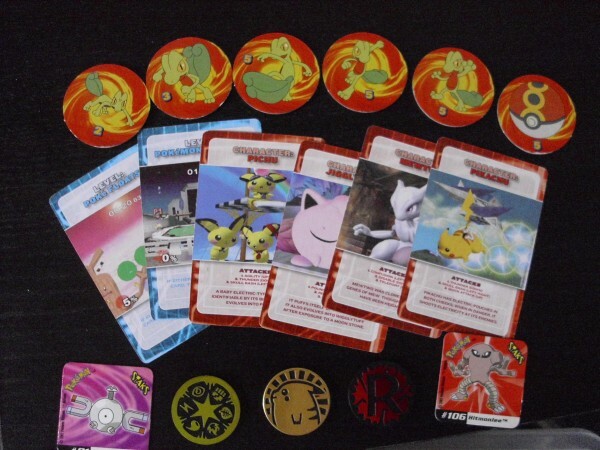 The Treecko counters at the top came with a Pokeball shooter, which I believe Treecko came with too. I can't find the ball. :( The cards in the middle were given away as a Super Smash Bros. Melee set in the UK Nintendo magazine. The Magnemite and Hitmonlee are called Staks- they're square magnets that were collectable many years ago. 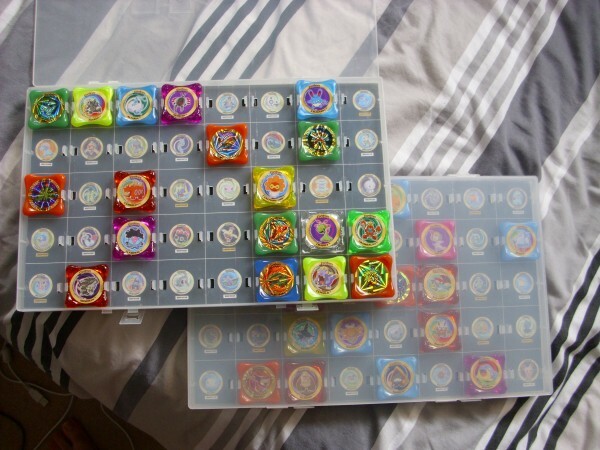 I had a lot of them in a folder and had the game board too, but I can't find those right now. The three coins are from TCG decks- I'm pretty sure I have more but they must be somewhere else. 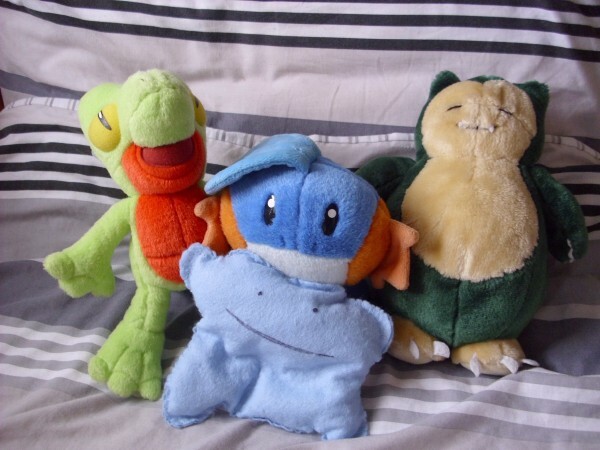 This is my oh-so-small plush collection! Snorlax is the oldest, I've no idea when he came out. 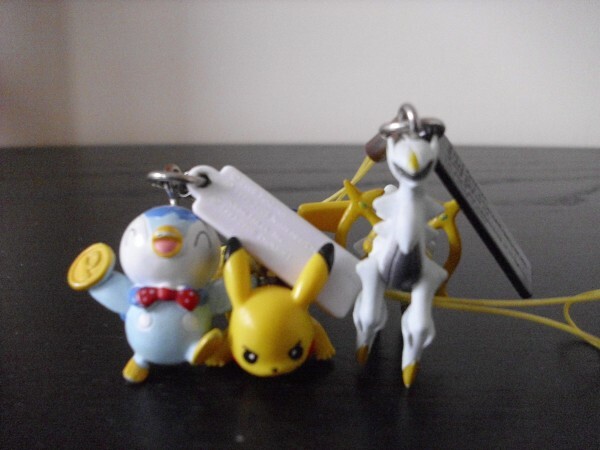 The two Hoenn starters were released at the same time as RS, I really wish I had a Torchic to complete the set! The (squashed) shiny Ditto in front is made by me! First plush I've made and it's very lacking, but I love it nonetheless! 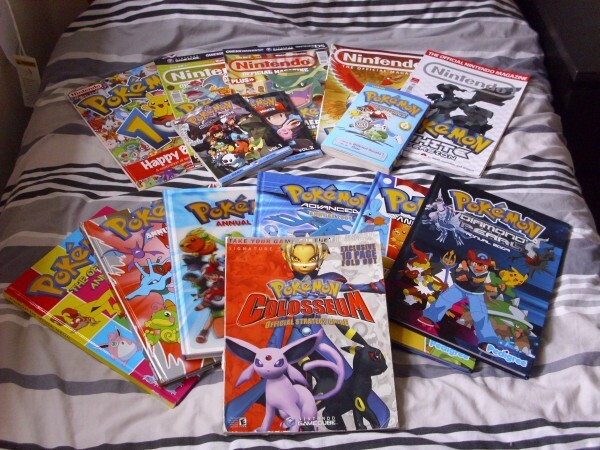 Various Pokemon books I own. 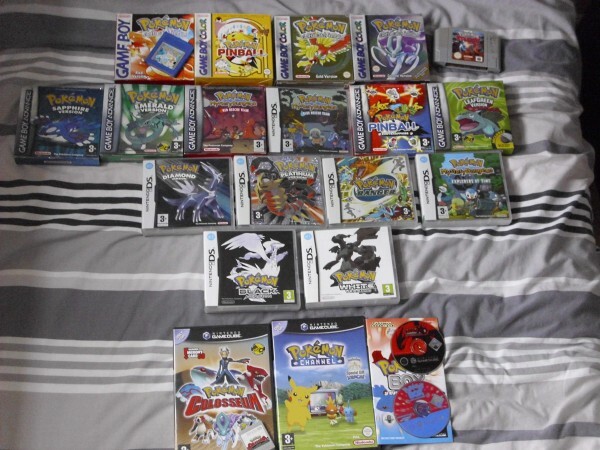 At the top are my Nintendo magazines that feature Pokemon- I have the 10th Anniversary edition, FRLG, Emerald, HGSS and BW on the covers. Soon I'll be adding BW2 to the collection! 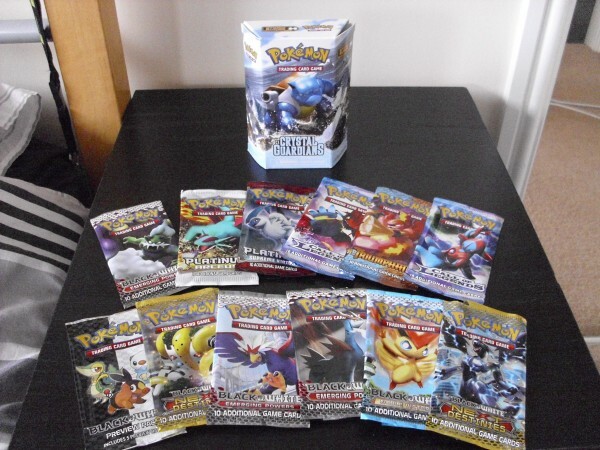 I also have my Pokemon manga here- not many right now but it'll be slowly growing! I have Pokemon Adventures Vol.1, and BW Vols 1 and 2. I also have my annuals here- I have the original (2001), 2002, 2004, 2005, 2006 and 2009. I think I have 2003 somewhere, I might know where it is. I also have my Colosseum guide book! It's a bit worn on the spine, but apart from that it's in fairly good condition. These are some cards my friend gave me a long time ago. 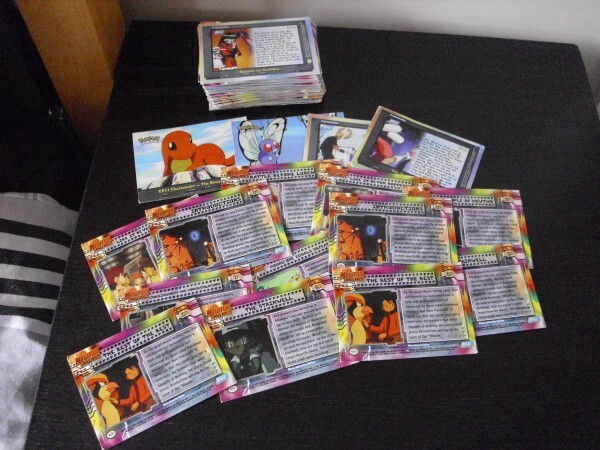 They're based on the anime, showing different scenes from episodes with a little description or just scenes featuring Pokemon, like the Charmander and Butterfree ones at the top. More cards my friend gave me at the same time. 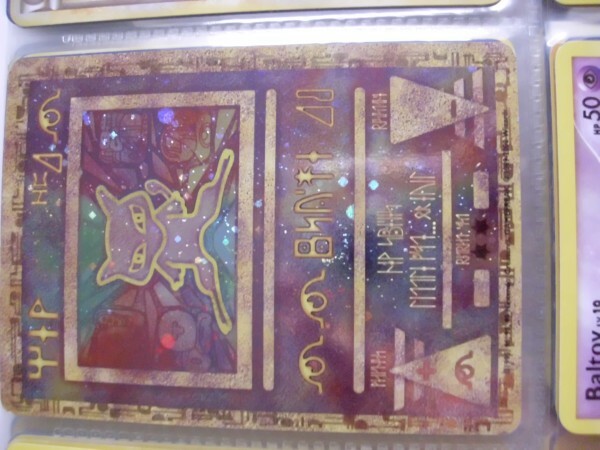 These just feature the original 151 Pokemon- rarer cards have patterns cut into the side of them, though you can't really see here. I haven't been through all of them but I think I have most of these. 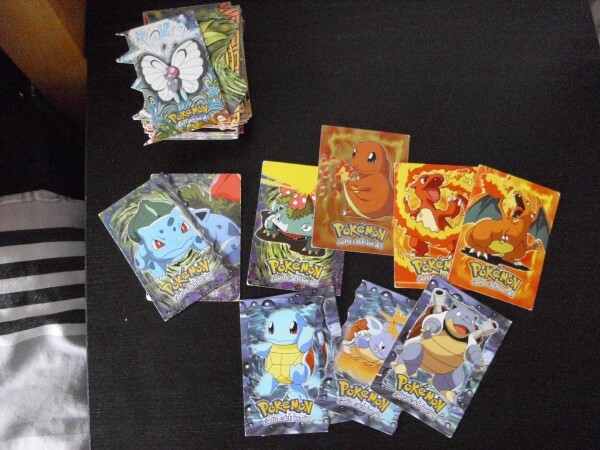 More collectable cards, these are lenticular and show the whole evo line of a Pokemon. The rarer ones are clear- you can't see them very well in photos. 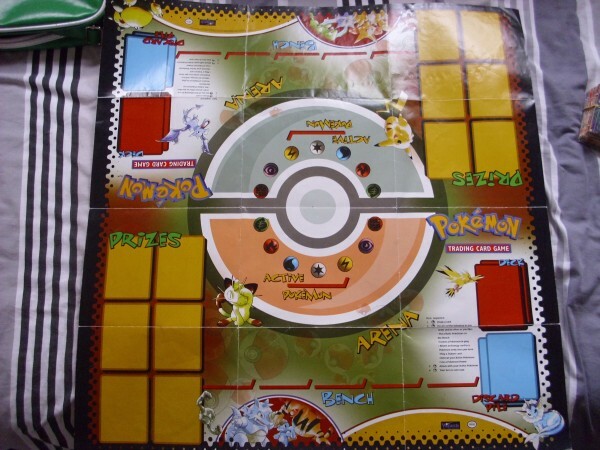 This is a TCG play mat from the original starter set! 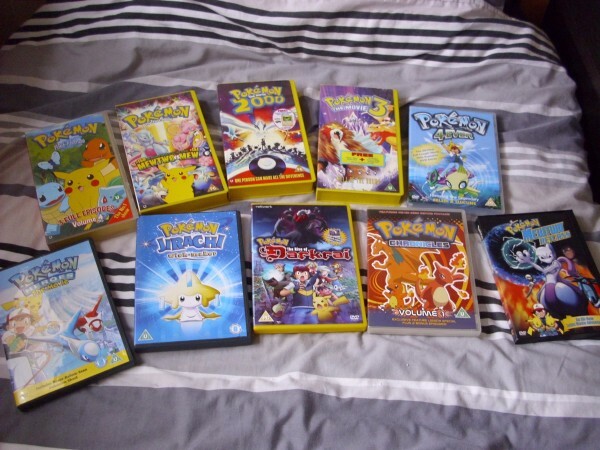 I still remember how overjoyed I was when my mum came home with the set one day, for me and my sister to share. The other side of this mat is designed to help beginners build decks, though it doesn't seem particularly competitively viable. 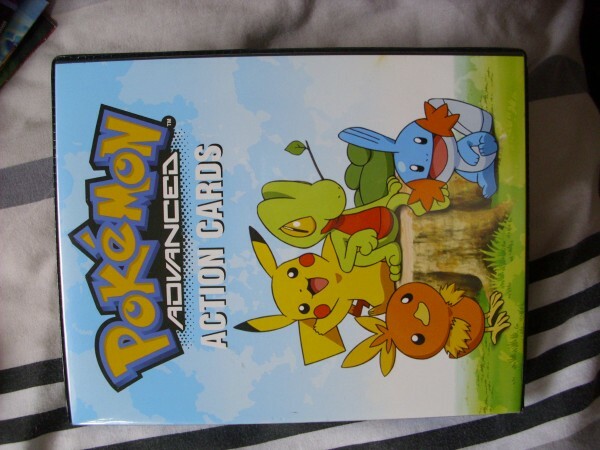 This is the case to hold the lenticular cards above, it seems they're called Action Cards and were from Gen III. 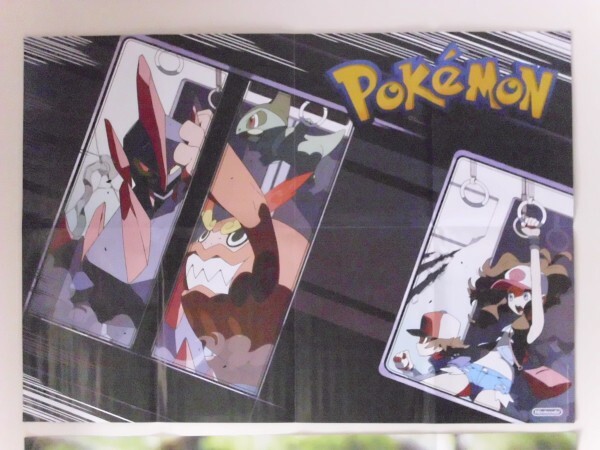 This is a promo poster for the Next Destinies expansion in the TCG, it was in Monster World magazine that my little brother got, I convinced him to let me have it in exchange for a Mario poster! 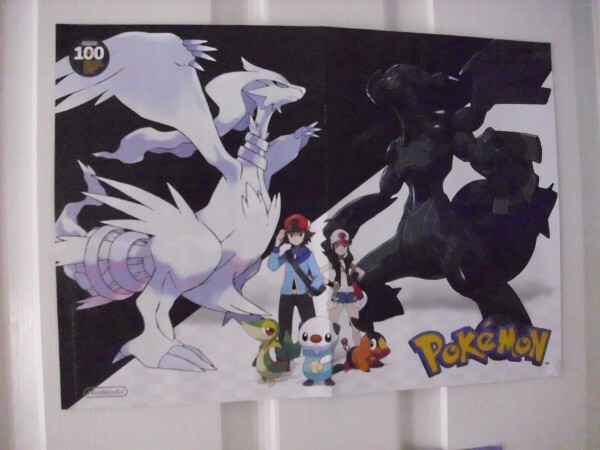 This BW poster came with an issue of the UK Nintendo magazine as part of their 100 greatest games list. 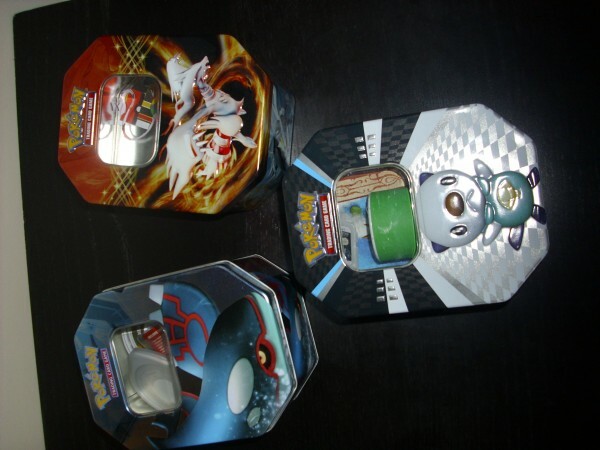 These are my three TCG tins! I love these tins, not only do you get a promo card and 4 or 5 packs within them, they're excellent storage! I use one for my PSP games and another for my DS games. The Reshiram one- my latest- is empty right now as I haven't come up with a use for it yet! I'll probably use it to store more Pokemon items. These are my two Pokemon card binders! 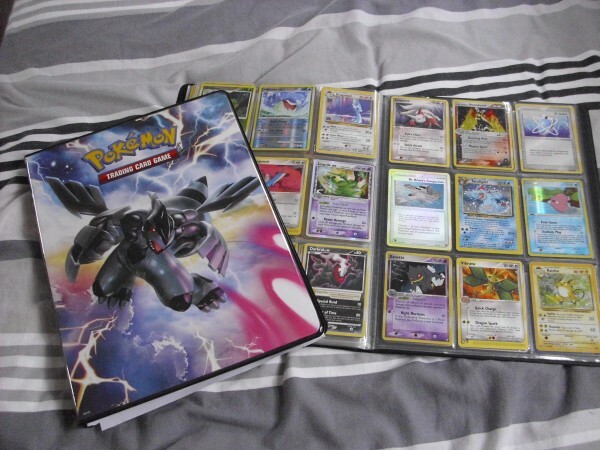 I showed the second one open as it's a generic binder, but the other one is from Next Destinies and features Zekrom on one side with Reshiram on the other. You might notice it's the same art that's on the promo poster. c: They're both full, with leftover cards kept safely elsewhere, I need to buy another binder for those! 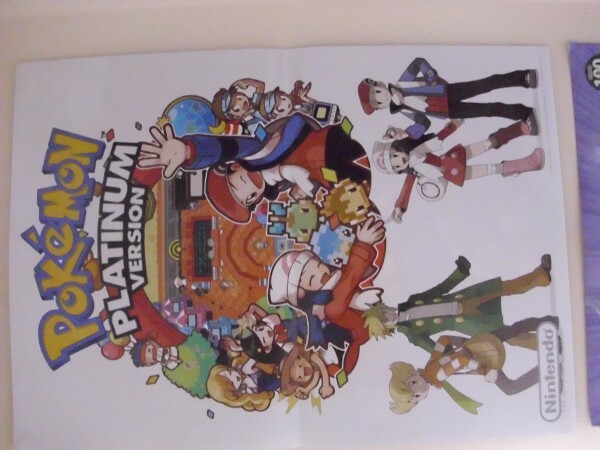 Another poster, again from the UK Nintendo magazine. Probably my favourite poster I own! 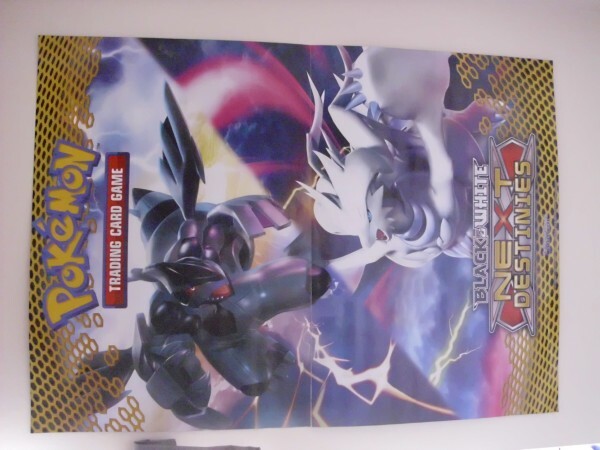 It's huge (A1 size) and it dominates the wall above my bed! I've been wanting this up for a long time now and finally got around to moving other posters round to make room for it! Here, have a wall shot! 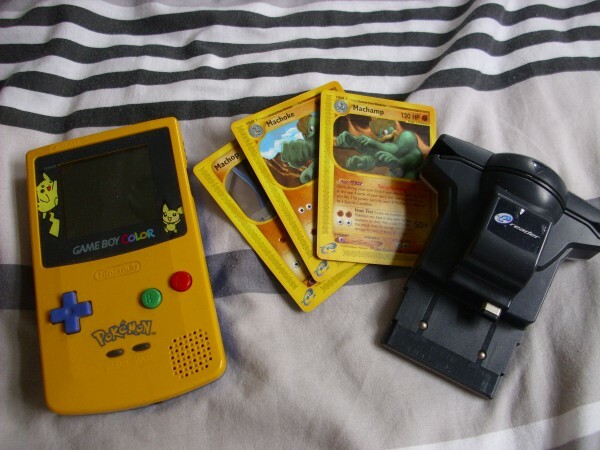 My trusty Pikachu and Pichu GBC! Played Red, Gold and Crystal on this fella, and I still love it. :3 Also got an e-reader that I longed for for ages. I got one and it was fun for a while scanning in various Pokemon cards. 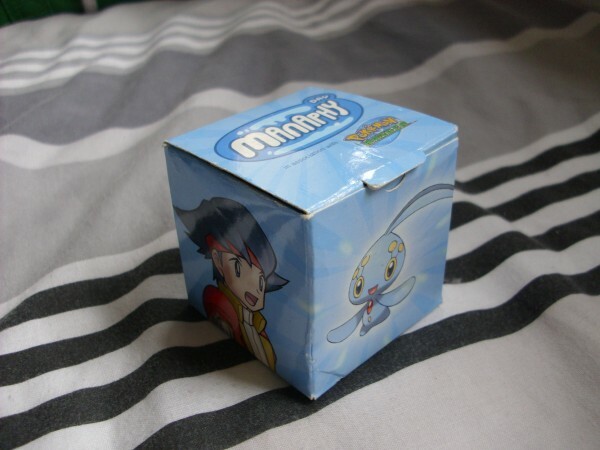 The only physical Pokemon event I've been to was the Manaphy one, since my local Game store was doing it. I have to say the chocolate Pokeball inside was delicious! Didn't last very long. 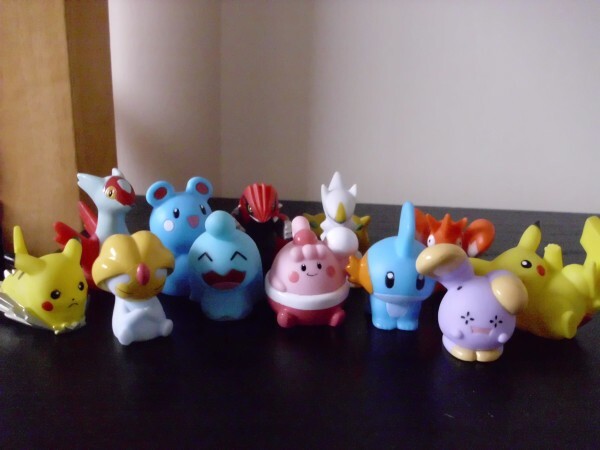 I was so happy to get Manaphy as well! 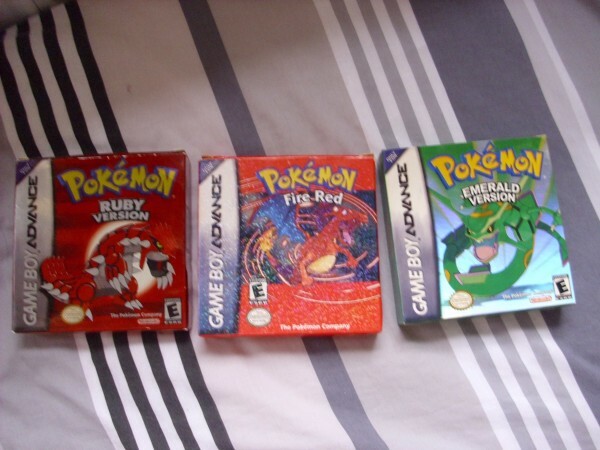 The backbone of my collection: my Pokemon games. There's not many I don't have. :P The ones I'm most happy to own are probably Red and the original Pinball for having the boxes in good condition, and XD and Box due to the fact that they were difficult to get hold of (for me at least)- I wish I had the proper case for XD though.